Births, legs back and a prolapse! Three, Two, One….births, legs back and a prolapse! On Monday one of the females on agistment went into labour, after no progress was made I intervened to find both legs locked back. Once untangled a lovely blue black male (Sire: Black Sabbath) was born to Riverdance a beige female. The cria was quickly up on his feet and all looked well…until she passed the placenta…with uterus attached. The rain at this point had started to pour down and all of the females in her paddock ran to the barn for cover. With the cria coated, I decided to leave Riverdance out…the floor of the barn was likely to be dirtier than the clean grass she was sat upon. The vet arrived quickly and requested cold water with Hibiscrub rather than the warm water I had ready for him. The reason for this is the cold water makes the uterus contract and thus easier to replace. Riverdance has been stitched as when she sat she looked like she may prolapse again. The stiches are to be removed tomorrow.She was given calcium, antibiotics and pain relief and appears okay. The unfortunate news is that she has severe arthritis. I did think that she had some stiffness in her hind legs and that this may be the cause. This had worsened with the duration of the pregnancy. However, upon replacing the prolapse the vet could feel that her pelvis and hips were swollen and stiff. This was the reason for the legs being back as the pelvis could not expand as it would normally. So no more births for Riverdance. The next two births were also agisted alpacas (all three different owners). First on Tuesday was Butterscotch owned by Amanda of Florens Alpacas. Butterscotch birthed with ease producing a bouncing beige male sired by Goldmine. Willow owned by Wiseman Alpacas started in labour at the same time as Butterscotch, but no progress was made. It did take a bit of working out what was going on in side. I managed to get the first leg out easily but the second was hard to find. Eventually I figured that it was crossed in front of the head pushing the cria’s nose down and preventing presentation. I managed to free the leg and the head presented quickly but crown first rather than nose. With a little more help Willow did manage to produce a lovely light fawn female (sire: Almost Illegal)…who wouldn’t straighten the leg that had been bent back…with plenty of massage and helping her to straighten the leg she eventually was up and off. It was as if the cria had the leg bent for so long,it felt strange to straighten it! 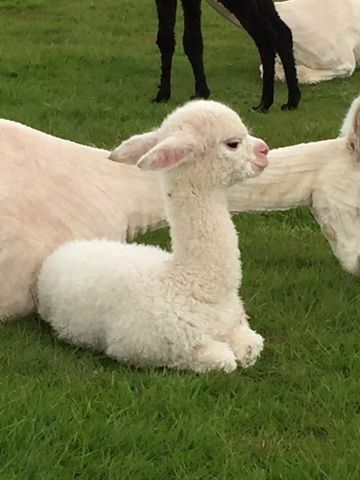 Paul is off to Heathrow tomorrow afternoon to pick up Ep Cambridge Gunsmith our new grey male, whom we share with Stuart and Jean from Velvet Hall Alpacas. I enjoyed our two days of shearing this year, it was lovely handling all the fleeces as they came off the alpacas. The Beck Brow Explorer progeny fleeces were very pleasing and this was reinforced when we received the fleece stats on Monday. All of our juniors were either ultrafine or superfine. First Edition MFD 16.6 SD 3.3 CV 19.6 CF 100% was the finest of his intermediate progeny. Does anyone know the time??? ?